Do you like onion? I have to admit I hate it! And it is not only because it makes me cry when I prepare it, or it is the specific smell that drives me crazy. But the “rational part of me” knows that my personal feelings towards raw onion do not correspond to the massive impact onion has on us human beings for body, skin and hair care! Hands down – onion is a must-have ingredient if we want to be healthy and look good! 1. What are onion benefits? 2. Does onion juice regrow hair? 3. How to make onion juice for hair growth? 4. Are there any side effects of onion juice on hair? 5. How to prepare an onion juice recipe at home, which will make your hair shiny and healthy! Let’s start, and “dissect” the onion to find out what is behind the hood, what’s working and why! What about onion compounds & benefits? Onion (common onion/bulb onion/Allium cepa L.) is an ancient vegetable plant, with close relatives like garlic and leeks. Its popularity worldwide is enormous. And for a reason (or even many)! Wow, what a chemical treasure we have here! Only enumerating the compounds of onion is enough to show how powerful is this plant for us, people. 3. It has anti-bacterial power, opposing hair loss and scalp infections like dandruff. I hope any doubts are gone why you should include onion among the ingredients for your hair care. Does onion juice regrow hair? To answer this question, let’s explore some facts from an experiment, published in The Journal of Dermatology. The topic of the study was the potential of onion juice as a topical treatment for Alopecia Areata. In plain English, this term means patchy hair loss condition. What happened? 23 patients, both male and female, treated their hair with raw onion juice daily in two months period. The results? After the second week of the treatment, the first regrowth results appeared. In the first-month mark, hair regrowth experienced 74% of the participants. Two weeks later this percentage rose up to 87%. Both men and women saw the effect of the onion juice therapy for hair. The conclusion: Yes, onion juice can make hair regrow! Hair loss treatment with onion juice is mission possible. How to prepare onion juice and how to apply it on your hair? Actually, it’s pretty easy. Did I mention you onion is 90% water? The easiest way is to use an appropriate kitchen utensil, like a juicer, or a blender. Just peel 3-4 onions before the manipulation, cut them into large pieces and squeeze the juice out of them. If you use a blender, filter the smashed onion in a cloth so that you split the sauce from the paste. If needed, when the juice is ready, you can finally filter it to remove any hard onion particles left. And voila – you’ve been covered! Massage your scalp and hair roots with gentle circular movements of your fingers, and leave the juice on your hair for at least one hour (if you don’t feel any discomfort and can extend this procedure – do it). It’s good to have it fresh before application, but if not suitable to prepare the onion juice more frequently, you can store it in the fridge for a few days to a week time. 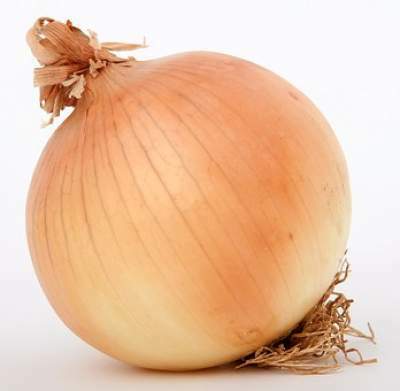 How to remove the unpleasant onion odour from hair? To mitigate the sharp onion smell, you can add some fresh lemon juice to the liquid. As an additional step, after the procedure you can wash your hair with a natural shampoo, containing peppermint oil, neroli oil, orange oil, or similar citrus fruit ingredients. An alternative measure you can take is to rinse your hair with homemade rose water, which will absorb the odour. 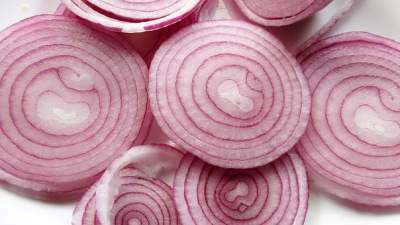 Are there any side effects of onion juice? 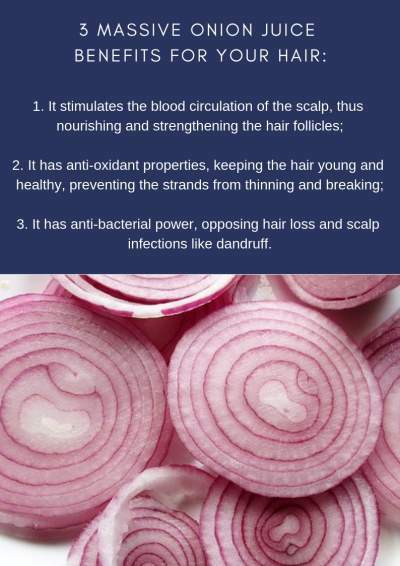 There is no harmful effect of onion juice on hair. Still, there might be a small chance that you are allergic to onion. A possible negative consequence might be skin irritation, redness, itching. To be sure you are okay with onion juice, apply a small quantity on your scalp. If you can live with it, then go with the full procedure! It would be good to keep the juice away from your eyes, and avoid uncontrollable tears, due to a release of a volatile gas which you don’t want to deal with. If still, you let a contact happen, immediately rinse with fresh water. How often can/should you use onion juice? Do you remember the study mentioned above? The participants had to apply onion on a daily basis to see the results. I know – it sounds harsh, but as very often happens in life – no pain, no gain! Having said that, not only you can use onion juice on hair daily, but it is preferably if you want to see sustainable and quick results. And there is always the other side of the coin. If you don’t have the time, you don’t want to put all that effort, or by any other reason you can follow the strict course, you always have the opportunity to massage your hair with onion juice as often as you can or wish. 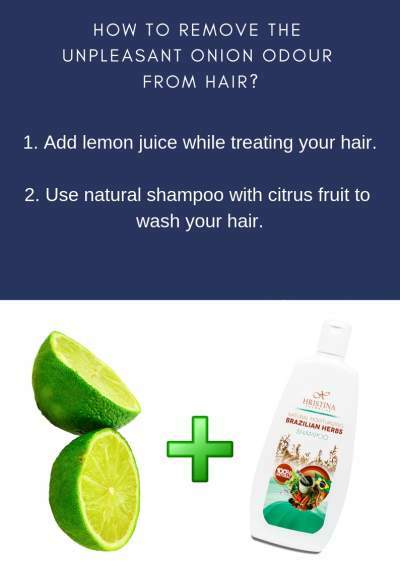 This will still help your hair feel better, healthier and shinier! How to take advantage of homemade recipes with onion juice for hair regrowth? You need 2-3 onions and 1 tablespoon honey. Honey is full of vitamins and minerals that support hair regrowth. When you get the onion juice, mix it with the honey and stir well. Massage your scalp for a few minutes and wait for half to one hour – the more you can do it, the better. Can you leave the onion juice overnight on scalp? You bet you can do it – it’s all about the effort you would like to put in that direction. Rinse with warm water. For even better results, you can use natural shampoos for hair growth, which have the appropriate for the purpose ingredients. If you want to experiment further, you can add chopped onion into your shampoo – this will boost its power. Apply this hair mask once a week, but “the more, the better” rule is relevant, as well. Depending on how severe your hair loss issue is, and how often you can afford to prepare and use the mask, you might go with it on a more frequent basis. You need 2-3 onions and 1 tablespoon fresh lemon juice. You need 1 -2 onions and a cup of rum. Cut the onions into pieces and put them into the cup of rum, leaving this mixture to stay for a night. On the next day massage the hair roots with the rum, and leave it for one hour. Rinse with warm water. You can do this mask once or twice a week. I hope now you have all the info needed to start using onion juice for hair regrowth. You know why is onion so valuable for your hair, how to apply it the most proper way, are there any side effects, how to use it with homemade solutions, and how to diminish the onion juice smell which could always be a reason for you to give up and not get advantage from this beautiful natural gift! Of course, onion juice therapy could be combined with effective natural hair care formulas to enhance your efforts to have healthy scalp and hair! You have to do your homework and find such appropriate products on the market. Whatever solution you pick, be proactive and give your hair what it deserves – the best possible treatment. The effort will pay off! I would love to hear from you! Do you (plan to) use onion juice for your hair? Leave me a comment, and I will get back to you!